Here at Frugal Follies, one of the things I stress is that you can eat healthy while using coupons. Although I do admit I have a sweet tooth, and I do buy some processed foods, generally I find and post the great deals I find on produce and other healthy foods. My family's health is just too important to leave to the cheapest food available! It's an investment in health to spend a little extra money on good food instead of buying the ramen noodles and box dinners that are so cheap when bought on sale with coupons. From what I've learned, your body digests vitamins the best when they come from real food sources. Most vitamin supplements you find at the drug store are made in a laboratory and could be made from petroleum or coal tar. (Yuck!) Mineral supplements may come directly from mines in the ground or are made chemically in the lab. Tests show that the body does not absorb these types of supplements well. Vitamins found in real food are easier to absorb and retain than synthetic vitamins. So will eating a lot of produce and natural food meet our vitamin and mineral needs? The problem is, today's corporate farm-grown vegetables are often stripped of the vitamins that they used to have. Enter NutriVerus. 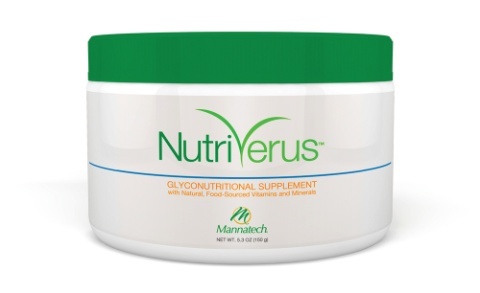 NutriVerus powder, made by Mannatech, combines natural, food-sourced vitamins, minerals, glyconutrients, and fat- and water-soluble antioxidants in a nutrient-dense real food base of rice bran and organic fruits and vegetables. It claims to boost your energy and support your immune system. But does it? I'm trying it for one month to see if it works for me. So far, I've mixed the powder into smoothies that I've had each day. It mixed well with the smoothie and I didn't taste any difference with it in. You can also mix it into other liquids, soft foods like applesauce, or just sprinkle it on top of food like any condiment. And is it helping? I do think I have a little more energy, and I do seem to be sleeping better at night. But it's so early in the process, it's hard to tell whether the NutriVerus is really working for me. Stay tuned - I'll be posting about my NutriVerus journey throughout the month! I'll also be posting more about how NutriVerus works and how it can help you! And, I'll also have a post a little bit later about how you can save on your NutriVerus purchases, and how your purchase can help children in need! Would you like to try NutriVerus? Go to Choose Real Food to order! Frugal Follies is hosting a giveaway for a 30-day supply of NutriVerus! To enter, use the Rafflecopter below! The giveaway is open to US residents aged 18 and older. This giveaway will end on Thursday, May 31th, at 12:01 am Eastern time. If you are the winner, I will contact you shortly thereafter, and you will have 72 hours to respond. If you do not respond within that time, your entry will be declared invalid and a new winner will be chosen. I have my fingers crossed. I love that powder!! I really am curious to see if something like this would work. I could use more energy. I would love to try this product to see how it can benefit my overall health. Why would I like to win? I DO believe in supplements and vitamins! And lately, I have been under a lot of stress... I would love to try this product! I could use the energy. I would like to win because I need all the help I can get improving my health and weight loss. I could use the energy and weight loss. I'm always looking for a healthier way to live and being a flight attendant I don't always have the option to eat healthy. This would be a great opportunity for me to try something different. I would like to win so that I know I will be getting all my vitamin and minerals. So I could get all the nutrients I need. I am a flight attendant so I am always looking for something that is going to help boost my immune system! I am so trying to be healthier and I already have a low immune system and do believe there are products that help. There are so many out there which don't work. After reading the review, I really would love to try this one. I'd like to win because I've had a hard time finding a supplement that works well for me and this one seems to have numerous benefits. I would love to win because I need more energy and this sounds like a wonderful and safe way to get it! i would like to try it because it claims to boost your energy with anti-oxidants. After four kids, I am soooooooo tired. Vitamin B12 does nothing for me, and I refuse to resort to unhealthy energy drinks. Maybe this is my answer! I have heard of this product once before, but never tried it. I would like to try it out and see what it is about. I find it frustrating that there is no way to know what kind of nutritional value our foods have now. I know they are lacking and simply don't have the flavor they once had. It would be great to have this product to help fill in the gaps. I would love to try this protein powder .I workout and can always use a new protein source. I'd like to try the Nutriverus nutrition powder. I have fibromyalgia and I'm always looking for something that will help with exhaustion and pain. I would love to try it and see if it gives me more energy! It claims to boost my energy and support my immune system! I want to win because I love to try stuff like this! I'd like to try this supplement. I'd like to win because I know I could use a supplement and I can't swallow pills so this would be a great way to get needed vitamins and minerals. I would love to win, need more energy and need better sleeping at night..
Hello, how are you? Thank you for this opportunity. I could benefit from some vitamin supplements.